The SSU Development Foundation recently accepted a gift of commercial property donated by Christopher Lute and his son, Jason, owners of Lute Supply, Inc. Shown in front of the property are Jason Lute, SSU President Rita Rice Morris, Chris Lute, and SSU Development Foundation Director Eric Braun. PORTSMOUTH, Ohio –The Shawnee State University Development Foundation announced it has accepted a gift of commercial property located at 347 Third Street in Portsmouth, Ohio. The property was donated to the University by Christopher Lute and his son, Jason, owners of Lute Supply, Inc. The donation includes 55,000 square feet of commercial buildings on a two-acre campus. This was the former location of Lute’s wholesale and retail plumbing, kitchen and bath showroom, and corporate headquarters. 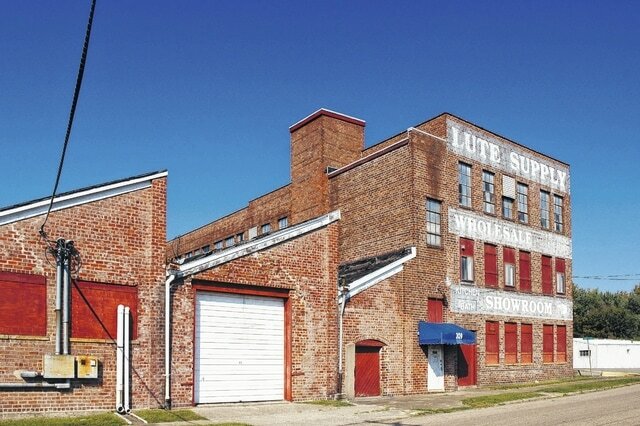 Lute Supply vacated the property when the company purchased property in Rosemount, Ohio in 2009. The former Big Bear property provided the company more room for growth, and doubled the size of its warehouse, office, and sales space. “Lute Supply is proud to be a part of the Portsmouth community, and proud of Shawnee State University,” Chris Lute said. “We appreciate the loyal customer support and resulting company growth we have had since my parents, the late Hobert and Izetta Lute, started our business in 1952. With deep roots planted in this community, our company has now branched out and operates 14 locations in Ohio, Kentucky, West Virginia and Indiana.” Lute Supply is a wholesale distributor in both the plumbing and HVAC business, and has added hardware in the Rosemount location. The Lutes were instrumental in the University’s ‘Reach for the Stars’ campaign in 1995, and also maintain a Lute Family Scholarship for Business and Accounting majors. The SSU Development Foundation is working with the University to develop a plan for future use of the facility. To learn more about supporting Shawnee State University with a gift, please contact the Development Foundation at 740.353.3248 or online at http://GiveTo.Shawnee.edu.